Also, check out the "Instructions for BlackMagicianGirl" text file included with this edit to understand how to play as her. I take no credit for making this character. Sankiti created this character. I've only edited her cmd file to make her moves easier to use. I hope you like her. Update: I have forgotten two supers Dark Magician Girl has. I have updated the rar file with an updated "Instructions for BlackMagicianGirl" text file to include the info on both supers for a total of six available supers. The link in this post is exactly the same, only with the updated rar file. If you did download this on the listed date I made this post, I recommend downloading this character again for the updated text file. Aside from the fact that an in-game screenshot of the character is mandatory for releases and edits, I also have a question regarding what you said. 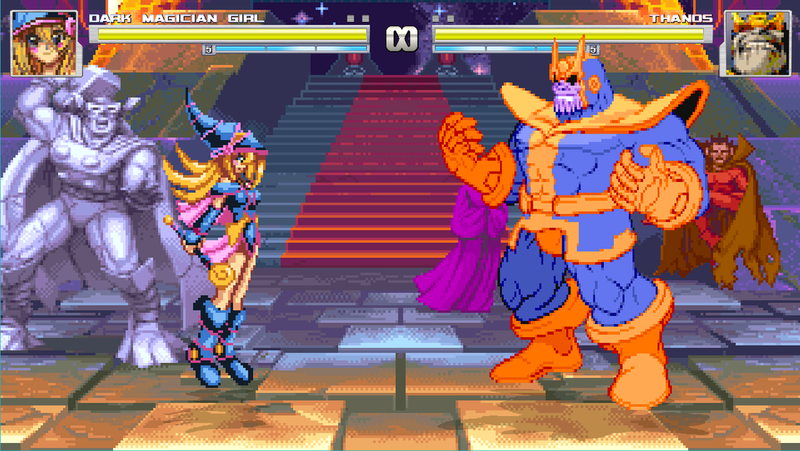 Check out my edit of Sankiti's Dark Magician Girl from Yu-Gi-Oh, with new and improved game play based on the Marvel vs. Capcom games. This edit is designed to make her specials and supers more accessible. I've only edited her cmd file to make her moves easier to use. So, what do you mean exactly? Did you only change the commands or actually editted her to resemble MvC gameplay more. Sorry I didn't include a screenshot when I started this post. I'll remember to do so next time. I hope you enjoy my edit.